Even at the time when the Congo was called Zaire, Marshal Mobutu had not so much flouted the Congolese and the world. Today, in preparation for the elections of December 23, 2018, the Raïs Joseph Kabila seems to have asked, in Lingala, Mende, Mova, Naanga, Atundu, Atama and Makila “Bobwaka lokuta” (throw up smoke screen). “We are ready,” they say. 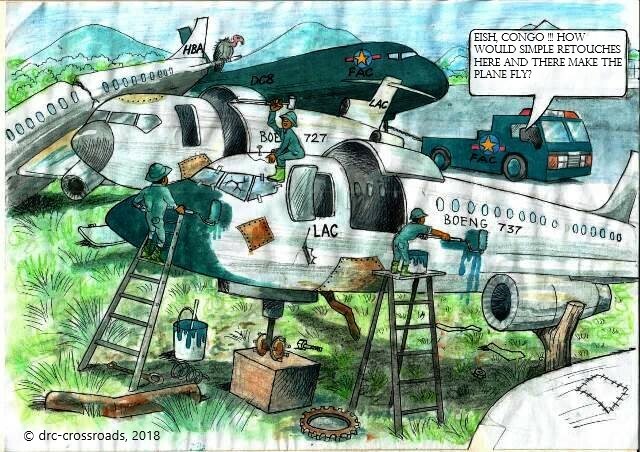 “The new planes are there to transport all the electoral equipment in the most remote areas of the Congolese territory.” But can these old airplanes, yet “new”, which the Kabila regime has self-financed at the price of “great sacrifices”, really fly, considering that they were recuperated from aircraft boneyards? It is to be feared, as we pointed out in our previous article (DRC crisis: Instrumentalization of public institutions to maintain power) , that these elections will not be credible, that they will be tainted by massive fraud and that they would lead to violent challenges. Everything points to a masquerade that leads to a result known in advance: The election of the FCC candidate to ensure the continuity of the Kabila regime. “The electoral process in the DRC is marred by controversies related, inter alia, to identification and enrolment, the number of which has significantly reduced voter numbers in other constituencies.” There are so many voters without fingerprints. The question was not addressed as it should be, so that all the stakeholders could finally agree on the electoral file. Another very delicate issue is the use of the voting machine. A worrying situation. The controversy is digging in. This controversy could be the failure of the elections scheduled for 23 December 2018, especially in light of the calendar of the electoral process published by the Independent National Electoral Commission (CÉNI), it is mentioned that from 20 September to 6 October 2018, that is 17 days, is the period of technical preparations for the printing of ballots, minutes and results sheets. This includes cleaning and consolidating the database of the candidates. And, from November 16 to December 5, 2018, 20 days, will be the period of deployment of ballots, sheets for minutes and records of results, and others, to training sites. “These elections will not be credible,”  the authors of this report immediately conclude. They denounce, among other things, the “subservience” of the electoral Commission to power, the “sugarcoat of the legal framework” of these elections with, for example, a distribution of seats which was made before the audit of the electoral file and while this audit revealed a “significant number” of voters “poorly identified”. 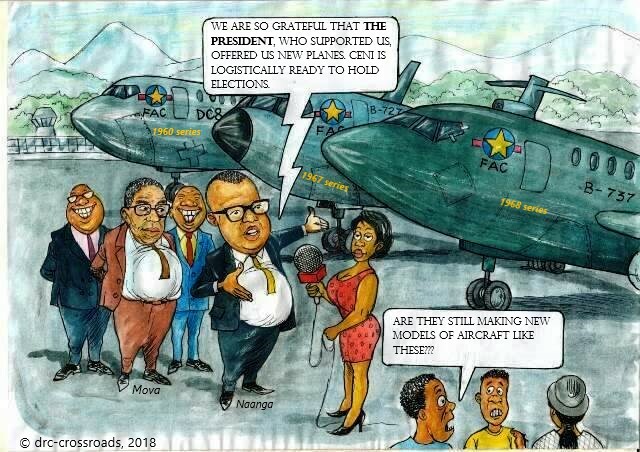 Next come logistical issues: the “controversy over the legality” of the voting machine, the lingering doubts about the ability of the electoral Commission to deploy this machine in time, or even the use of the Congolese army to route the material. Army can be read in the report “whose political neutrality is generally called into question“, which does not “mitigate the suspicions of planned electoral fraud”. But that is not all: the authors of the report are also concerned about the delay in the financing of these elections, “still not guaranteed at this stage“. Not to mention, the deterioration of the security environment, particularly in Beni in the eastern part of the country where an Ebola epidemic is also rife, which may “prevent” many voters from exercising their right to vote. They also deplore the repeated “violations” of the right to protest at the approach of the ballot, and finally the lack of neutrality of the judicial organizers who will be responsible for examining disputes and other remedies related to elections.